Exactly... but generally that was the way it was done before the mid 1980s. You either had a machine with RGB but only 1 or 2 bits per component, or you had a machine with a hardcoded very limited palette, or you had what most Ataris had. Given the choice, we got the right one. Back on topic, maybe we need a HSC for this game. I've been able to make it to the level where it's crowded with motherships at the start (4?) - score about 34,000. For some reason I get a roll on for a while but once losing a ship it'll usually be a cascade effect. Thanks Keetah and Jetboot for the settings, I keep seeing settings but most are not how I remember them for PAL, I never had an NSTC source so I have no clue what is as near right as possible hence the numerous asks. Obviously with the issue of colour in general on the Atari's being so varied from machine to machine it would be great for a group effort to gain an average ball park of settings to try, I'm presuming the variety isn't as wide as I believe and there's a sort of range band that is there for both NTSC and PAL to narrow it down. Yeah I know that what one person likes is likely to not be what another likes but at least if we had a selection of palettes it would give the new user or even the old one a range to choose from without having to try fine tuning the colours by hand, I myself don't like touching that part as I have no clue if I set one part that it will affect another part and I end up with a mess, ok I can reset it but that part is really for people like you guys and Avery who know what choices should be left alone and what to tweak. 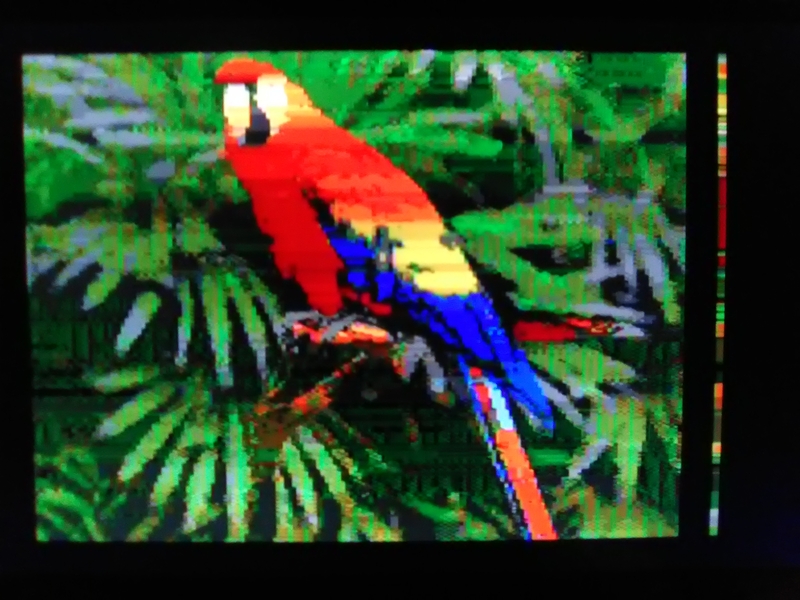 I usually end up with the right screen colour for boot up but when I load games they look wrong from memory..
For A8 I favour the PAM palette - "277NTSC"
Edited by Gunstar, Wed Mar 29, 2017 8:26 AM. ST/Amiga are different. They generate RGB and in both cases use the same off-the-shelf IC to create the chroma/luma signals for TV output. The problem with the "old way", ie initial video chip output based on chroma/luma is that often they don't bother looking after saturation properly. I've got proper red on my PAL 1200XL with SuperVideo 2.1 upgrade, which of course upgrades the unique 1200XL chroma saturation boost circuit. Here is a screen shot of a Rasta image on my PAL 1200XL. If that's not proper red, then I guess I don't know what is, and I'm a educated and talented artist, with an eye for color. Of course I know my Atari is unique and that most PAL Atari's don't have proper red. But it can be achieved! At least on a 1200XL (or with a VBXE). Edited by Gunstar, Wed Mar 29, 2017 8:33 AM. Thanks Keetah and Jetboot for the settings. IIRC I didn't change much (if anything) in my settings screenshots. IIRC they are default. Also my monitor has all the color default sliders set to 50%. I may have bumped the contrast or gamma (on the monitor) a bit to match room lighting. I remember periodically adjusting the color/tint and brightness/contrast on our old Chromacolor II from Zenith. I'd use a baseball game. Get the grass green, the helmet blue, the fleshtones looking healthy, the coke logo red. Took but a minute and then later in the evening I'd play Star Raiders. And it all matches in my memory and what everything is supposed to be. Sure you can get into palette optimization, and do some lengthy fine tuning, but I found emulator authors have spent some time researching this. And it suits the needs of me and my guests. Some of them even commented (about the emulators) that the sound and COLOR is spot on and how they remember it. Sure, 40 year old memory won't discern the difference between R200-G200-B223 from 1979 and R202-G199-B119 in 2017. But it will tell you if it feels right. And green shields do not feel right! I never worry about any diversions or forks in threads, they often spur discussion and thought. Maybe someone will now enjoy better color accuracy because of this! It's not like the whole thread is now about palettes or anything. It will resume Bosconian discussion just fine on its own. Memory can be a funny thing. And there is the possibility you were exposed to the wrong colors back in the day - so you have to consider that too. But it *IS* nice to finally get OOTB default colors that "Lock-in" that make you say, "Ahh hah! Now we're cooking with gas!" And for NTSC on Altirra that was somewhere around 2.80 - 2.90.test.27. Since you're in PAL land, why not ask Avery how much research he has done into accuracy for that mode. Maybe PAL is spot on? Dunno. I don't even have 40 year old memory to fall back on. Hi Keetah, asked Avery before and he mentioned a lot of stuff that went over my head but as for PAL, he has no setup for that to analyse. He also mentioned pretty much the same thing re the Atari variation from machine to machine. I also forgot that there's subtle differences on monitors via the 'warmth' control. Edited by shanti77, Thu May 18, 2017 2:16 PM. Nothing to blame there Great stuff ! Edited by _The Doctor__, Thu May 18, 2017 5:14 PM. Looking nicer but the formation attacks are a bit too hard. I made it just past the start of Level 4. Are there extra levels now? This is really cool! Thank you for doing this! Re your VBlank problem. I devised a way to allow IRQs to run during almost all VBlank processing. The problem is the system handler runs with IRQs masked and only enables them so long as an IRQ wasn't active when the NMI occurred (stack check). The way around the problem of active IRQ is for the VBlank to trigger a "Serial Output Complete" IRQ which can be done on demand simply by enabling that IRQ. Then just return from the VBlank interrupt immediately and use the SEROC routine to do the VBlank processing. First thing to do in that routine after register save and mask further SEROC IRQs is to enable further IRQs by CLI. This way, the VBlank processing can be as long as you want without the problem of IRQs being masked for too long. Of course you'd best be served by using your own IRQ routine either at system vector or VIMIRQ level but that's not too much work. I've used Altirra to load the .xex above, it shows the new graphic on load up but then crashes. I'm using it with the 65XE with 64K, version 2.90 test 8 of Altirra. I'm pretty sure the game requires 128K. Using Altirra (2.90 test 30) it crashes with 64K but runs with 128K (remember to press FIRE after the logo). Ahh, I see! I have switched it now to 128K and it has loaded. I played an older version of the game on my real 65XE the other day, have the memory requirements been lifted? Those hieroglyphics that appear in the status area during digital speech are really distracting. It may have been addressed (not going to re-read the thread) but I assumed they're there because the sidebar uses mid-scan changes and couldn't be maintained during digital playback. I assumed as much, and in this case I'd argue that nothing would be better than those cryptic shapes briefly appearing. gee they seem to match up describing what caused the alarm or what kind of enemy was sighted.. that's not a distraction.... that's information! Edited by _The Doctor__, Fri May 19, 2017 10:43 PM.